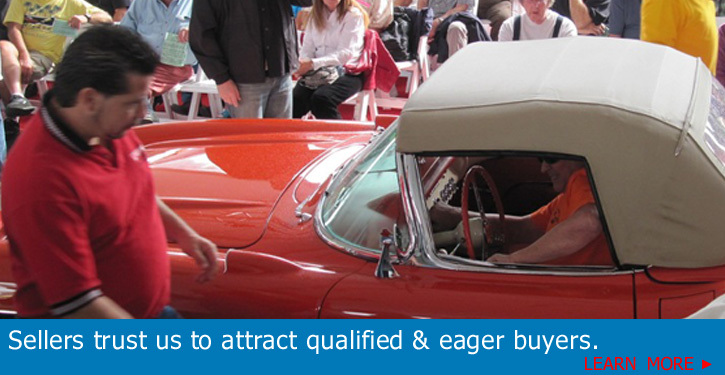 Choosing an auction company should based on the company's integrity and stability along with expert level knowledge as this is one of the most important business descisions a consumer will make...We have been producing classic car auctions in Palm Springs for 33 years! We are just 6% auction buy fee, the lowest in the business. We also offer FREE storage for cars purchased by our overseas, Canadian and out of town buyers. VIP BIDDER REGISTRATION - $ 100 - The VIP Bidder card is valid for 2 consecutive events and includes the following: Photo ID card, admission tickets for you and a guest, VIP red carpet seating right up front, FREE food Friday night for you and a guest, FREE Champagne Happy Hour for you and a guest in the main auction tent on Friday from 11am - 12 noon and you are welcome to attend our 'Sunday Morning Coming Down' with FREE Mimosas and Bloody Marys in the main auction tent Sunday morning from 9am - 10am. ABSENTEE BIDDING...Want to bid but can't make it to the auction...call us now to set up an absentee bidder account. This requires a 20% deposit on the maximum you are willing to spend and we will proxy bid for you. This must be completed no later one week before the auction.